"Tommy Netzband The Most Haunted Man in California"
This island has many layers of history and once was a fort, a military prison, a federal penitentiary and then seized and occupied by Native Americans who retook the island in 1969. The layers of history and intense emotion make this place the #1 most haunted spot in San Francisco. People hear voices, walking, cells slamming and there is a supposed evil presence in Block D of the main prison house. Many cold spots can be felt in the mess hall. See our short documentary "Secrets of Alcatraz" at www.sfghostsociety.org/html/cases. By Shannon McCabe, President of H.P.I.
" CALIFORNIA'S FIRST LADY OF GHOST HUNTING! – The Lady of Stowe Lake.... She glides along the pathways near the lake. She can manifest into an orange light or into a Palm tree like shape. A good friend of mine actually picked her up on camera... Amazing! Also see: HAUNTED HAIGHT, The Lady of Stow Lake HauntedAmericaTours.com. There is a lake inside Golden gate Park called Stow Lake. Many people boat on this lake and it has been a popular pastime since the Victorian era. "If there’s one neighborhood of San Francisco that everyone thinks they know all about, it’s the Haight- Ashbury. We’ve all heard ad infinitum about the tie dye, the drugs, the whole Summer-of-freakin’- Love trip. Fortunately, licensed tour guide Tommy Netzband has found a fresh spin on the old hood for his Haunted Haight Walking Tour." "THE BEST GHOST TOUR GUIDE IN CALIFORNIA!" Founder, San Francisco Ghost Society, Haight-Ashbury resident and licensed tour guide Tommy Netzband is the creator of the Haunted Haight Walking Tour. The ship is an amazing piece of work. As you drive up the 405 freeway you can see it looming in the Long Beach Harbor. Many specters have been seen in the first class swimming pool area and roaming the promenade deck. People have reported hearing doors slam shut, cold spots, wet footprints. The Queen Mary has capitalized on these hauntings and now has a daily tour geared toward the paranormal enthusiast. The Blue Riband was awarded to the ship that made the fastest transatlantic crossing. Queen Mary was awarded the Blue Riband in 1936 and from 1938 until 1952. The Queen Mary now has a static role at Long Beach, California. Placerville is located in the foothills of Sacramento, CA. It is an old gold mining town with tons of incredible history. There are so many haunted locations on Main street that you can practically walk into any store or bar and get a ghost story. Some of the places include The Cary House Hotel at 300 Main street, Hangman's Tree Bar at 305 Main Street, Hidden Passages Bookstore at 352 Main Street, Pearson's Soda Works or the Cozmic Cafe at 594 Main Street., and many many more! Off the beaten path about a mile away is the beautiful Sequoia House Restaurant at 643 Bee Street. Certainly worth the trip to this quaint little town! Placerville is the county seat of El Dorado County, California. Prior to the discovery of gold in nearby Coloma, California by James W. Marshall in 1848 sparking the California Gold Rush, the small town now known as Placerville was known as Dry Diggins after the manner in which the miners moved cartloads of dry soil to running water to separate the gold from the soil. Later in 1849, the town earned its most common historical name, Hangtown, due to the numerous hangings that had taken place there. By 1850, the temperance league and a few local churches had begun to request that a more friendly name be bestowed upon the town. The name was not changed until 1854 when the City of Placerville was incorporated. At its incorporation Placerville was the third largest town in California. In 1857 the county seat was then moved from Coloma to Placerville, where it remains today. Placerville was a central hub for the Mother Lode region's mining operations. The town had many services, including transportation (of people and goods), lodging, banking, and had a market and general store. The history of hard-rock mining is evidenced by an open and accessible Gold Bug Park & Mine, now a museum with tours and books. The Southern Pacific Railroad once had a branch line that extended from Sacramento to Placerville. The track was abandoned in the 1980s. The Camino, Placerville and Lake Tahoe Railroad (now abandoned) also operated an 8-mile shortline that operated between Camino, California and Placerville until June 17, 1986. As of March 29, 2007, 52 miles of the right-of-way have been purchased by the city of Folsom, and eighteen miles of track have been restored. Plans are under consideration for a tourist excursion train along the route. Placerville is nicknamed "Old Hangtown" (due to the fact that many people were hanged in the late 1800s). One of my favorite places on earth just so happens to be haunted! Space Mountain the ride, and the women's employee locker rooms are haunted by the ghost of "Mr. One-Way", a guest who died on the Space Mountain ride back in the 1970's. It is also said that the Christmas Shop on Main street holds a specter or two. Also, Tom Sawyer's Island, The old People Mover Ride and in Tomorrow Land there have been reported apparitions after the park is closed. I cannot wait to get down there with H.P.I. And do an investigation! The Georgetown Hotel is a quaint little 1800's saloon style hotel. It's located in the middle of Highway 49 between Auburn, CA and Placerville, CA. I just happened to be in the area at a friends home one night and thought, “that looks like a happening little joint, let's check it out”. Courtesy of The Bancroft Library. University of California, Berkeley. Located on the corner of Sutter and Octavia Streets. It is a beautiful Victorian Hotel that dates back to the 1890's. Miss Mary Lake's Room, room 410, is reported to be the most haunted in the hotel. She has been seen walking about the hotel and has even scared a few H.P.I. 'ers over the years. One of our investigators, stayed in room 410 last summer (2006) and reported that he could not open the door to room 410 for some time. He unlocked it, shook the handle but could not enter. Then the door just easily gave way and he could enter. Was it Miss Mary Lakes that didn't want him in her room? Maybe you should stay there and find out for yourself! One of our investigators, Mike Henderson, was lucky enough to go and stay on this island alone one night! I don't know about you, but I am not sure I could do it! He did not experience anything on this night, luckily, but there have been plenty of other people that have. Reports of cold spots, sounds of chains clanking, footsteps, screaming you name it! The history of the island includes military use as a fort, an army prison camp, a Native American peace community, and the location of America's most dangerous criminals. The prison held Al Scarface Capone and Robert "The Birdman" Stroud. The island was featured in movies including Escape from Alcatraz with Clint Eastwood and The Rock with Sean Connery. For prisoners, the worst torture was how close, but unattainable, was life in San Francisco. At night, prisoners could even hear parties and laughter across the bay. The island is also a wildlife sanctuary with birds, and tide pools filled with crabs and sea-stars. Western gull and black-crowned heron colonies are prevalent. Roses still grow by the old Warden's house. The National hotel is an amazing piece of architecture. Even if I didn't find any ghosts I would have been happy just to hang out there. Lucky for me, I did find several ghosts! H.P.I. Was able to pick up an EVP, with the help of a psychic, that said “Chill, Chill”.. Speaking of Chills... One of my investigators, Carol was alone up in room 74 when she repeatedly had cold chills up her back. It was a warm night.. Room 74 is reported to be the most haunted room in the hotel. The owners of this home want to remain anonymous but their spirits do not.. The homeowners have come to grips with the fact that they have some permanent ”house guests.” This makes for a great H.P.I. investigation! I have been to the home numerous times and have seen a white light fly by me in the hallway, I've heard some pretty unbelievable EVP's, and have seen some amazing video footage taken. (while I was there). What is so great about this home is that we've come to learn that each entity has a personality, one EVP even shows they have a sense of humor! My number one favorite haunted location! The Brookdale is also home of the H.P.I. Northern CA Paranormal Conference, (May 2008). We have so much ghostly evidence from the Brookdale, that one of the workers, Roger, is making a book out of it! The lodge is truly amazing with a babbling brook running right through the center of the “Brook Room”, it is the only building of it's kind. Ripley's Believe it or Not even did a show there. We captured some great EVP's on the bridge over the indoor brook, saw some glorious orb pictures with movement, and even had one conference guest, Maria, write about her crazy night at the séance with Nancy Bradley. The story is called “A Long Day At the Brookdale Lodge”. There are secret passageways and hidden rooms, it is so much fun to explore this lodge. There is even a room called the “Mermaid Room” where you can look into the bottom of the swimming pool through a glass window! It is said that the mobsters that resided here long ago, used to have “Mermaid” prostitutes. They would swim near the glass window for the mobsters to select them as dates for the evening. I love this place so much it is just an incredible get-away and I cannot wait to get back for the next conference! Abandoned Army Hospital ~ Many soldiers as the story goes were said to have died here, and their many horid crying and moaning ghosts or thought to still openly haunt this hospital in Park Presidio. Many are said to have encountered the ghosts covered in blood that cries for help. and that of the soldier looking for his lost arm. Alcatraz ~ Is the most haunted piece of relestate in the area. Haunt by the claims of many and certainly the hotest haunted hotspot in town. Bay Bridge ~ Many have witnessed erie fogs and often see strange shadow fingers darting in front of them day and night. Cameron House ~ Located on Sacramento St. in Chinatown, San Francisco. Once owned by Lady Cameron, the basement of the house was a refuge for Chinese immigrant from lives of prostitution and slavery, among the obvious discrimination and hell that was once Chinatown. She sealed the doors in the basement to protect the immigrants from inspections by the police. If she can't open the doors, they can't inspect and then arrest and possibly kill the rooms of people. However, the people were able to come in and out through a secret passageway. Apparently, rumors spread about her philanthropy and some people came and burned down the house. Everyone in the rooms died. Now, the restored Cameron House (turned church) sends chills up spines. The basement doors are still sealed, but every door contains a red charm and a gold charm to seal in the spirits, as well. Furthermore, the pipes that run along the ceiling run to the end of the hall forming an "X" over a door with the script: "do not enter." Photographs taken in the house have shown white figures in the background. Supposedly, these photos are nonchalantly mingled in with normal ones and kept in photo albums at the site. This possibly happened around the 1930's or so. It might be the late 1800's or the early 1900s. Most likely early 1900's. San Remo Hotel ~ 2237 Mason St, San Francisco, CA Legend has it that this historic, elegant hotel was once a brothel, and the Madame still holds court in Room 33. Safeway Park ~ 2300 16th St, San Francisco, CA The apparitions of baseball players wander the aisles of this supermarket, located on the site of the old Seals Stadium. Hotel Union Square ~ 114 Powell St, San Francisco, CA Famed playwright Lillian Hellman is allegedly the mischievous ghost who haunts room 207. Golden Gate Park ~ The Most Haunted Park in the state. Ghosts vampires and many strange time portal happenings and strange paranormal forces thrive here. Haskell House ~ ghost of Senator Broderick has been seen. And the ghost of a black woman with a kife inher hand is often the topic in hushed tones..
Neptune Society Columbarium ~ Located at One Loraine Court, San Francisco. Originally part of the Odd Fellows Cemetery, the Columbarium still stands over Geary Boulevard near Stanyan Street. This repository of the dead is not only wonderful eye candy, but has been a place of ghostly sightings as well. One encounter included a visitor having felt a hand on her back. When the woman turned around, no one was there. But a eerie white handprint remained on her blouse. Now a registered city landmark, the Columbarium is open to the public. Donations are encouraged. Also haunted by the ghost of Lorraine. If you call her name she will cuss you out on an EVP. Ocean Beach Sutro Bath - The sutro baths have quite a history behind them, as well as the tunnel that lies directly to the right of the old sunken building. It has been said that many people have been sacrificed at the end of this tunnel, and if you go at night fall and light a candle at the end of the tunnel someone will come and pick it up and throw it into the water that rushes up just beyond the rocks. Orchard Supply Hardware ~ There is a story of girl being murdered and raped in the warehouse area of the store 1 yr before it became Orchard. Employees have seen a figure walking and she is heard footsteps that seem to be the sound of high heels (No one wears high heels), screaming and laughing, as well as boxes moving. She likes to blow in men's ears and girls with long hair often feel a slight tug. One report of a worker that had just shrunk wrapped a pallet. The power went out and there is a 5 sec delay for the generator to kick on in that 5 sec something completely unwrapped the pallet. Queen Anne Hotel ~ Located at the corner of Sutter And Octavia, the Queen Anne Hotel is an elegant Victorian style hotel, which dates back to the 1890's. Room 410 top floor is where you can find it's ghost day and night. San Francisco Arts Institute ~ Many tales tell of it being built on a cemetery in the early 1900 after an earthquake. Strawberry Hill ~ Stowe Lake Golden Gate Park - It has been said that in the 1920's or 30's a woman became pregnant & hide the pregnancy from her family. She disposed of the child and killed her self in the reservoir. At night if you're at Stowe Lake you may see her walking around Strawberry Hill looking for her baby. The Mansions Hotel ~ Haunted by no less then 20 ghosts! Be ware of the ghost names Reynalds. Many say he will slap you hard against the face. Ghost tours are popular in San Francisco and the Bay Area and, like everything in the States, there are many to choose from. These include the Alcatraz Ghost Tour, the Chinatown Ghost Tour, the Vampire Tour of San Francisco and the Napa Ghost Winery Tour. However, The San Francisco Ghost Hunt is the only tour to guarantee a ghost sighting! (http://www.sfghosthunt.com/homepage.html) Our host, Jim Fassbinder, has been conducting this tour since 1998, promising his attendees will have an encounter with a San Franciscan ghost. As we assembled at the meeting place, the sumptuously tacky lobby of the otherwise grand Queen Anne Hotel, I wondered if Jim would arrange a clichéd trick. Would an assistant, in period costume, leap out at an appropriate time? Would a plant utter a disembodied, bloodcurdling scream? Then came the disclaimer, only ten minutes into the evening. "I can't really guarantee a ghost but many people have seen strange things on this tour and I hope that you too will meet a real ghost in a safe, supportive way". Clearly, a ghost sighting is all in the broad definition. Jim told us to "open" our senses to the possibility of "ghosts in all their forms. A ghost is an extreme emotion stuck in time". We could witness an apparition or poltergeist activity. Perhaps our photographs would reveal orbs, "balls of energy". We might experience a mystical fragrance, such as the overwhelming aroma of flowers, yet not see any source. A ghost may visit us in the form of an emotion, "ghosts are formed from emotional events" and can generate strong feelings. We should be sensitive to "cold spots" in the hotel and on the tour. Then I smelled a 'hot reading' as he told us to listen carefully, "because if you heard people discussing you from a room that turned out to be empty, you'd want to investigate it, wouldn't you?" If the Ghost Hunt couldn't guarantee a ghost, it guaranteed three hours of history, story weaving and sightseeing. We would hear tales of the Voodoo Queen of San Francisco, a bordello turned church, a feminist romance writer, a wayward bride, a wealthy pig-farming family of feuding sisters whose story ends in murder, of earthquakes, fires, friendly ghosts and violent poltergeists. All in the exclusive Pacific Heights district of San Francisco, famous for its magnificent views and the 'Painted Ladies' Victorian houses of Postcard Row. Before we could start the proceedings, Jim explained that he needed to perform a test to determine if the spirits were "willing to reveal themselves" that evening. Jim performed a card trick but all the while vowed it was a "paranormal" exercise. Upon receiving a "positive response that the ghosts would be out tonight", we moved into the hotel dining room where Jim dimmed the lights and shared a few stories about the century old Queen Anne Hotel. parlour or grooming herself before one of the hallway mirrors. The most curious phenomena takes place in her former bedroom, room 410, The Mary Lake Suite. Anecdotally, Mary Lake tightly 'tucks' her guests into their beds, every night! According to Jim, many guests report a "comforting presence" in the room. Other guests claim that they awoke to find her sitting on the bed, gazing at them. With the room booked out for months ahead and at US $350 a night, this one will have to remain a mystery! We were then granted ten minutes to explore the premises. Jim had told us about an unspecified chair that Mary Lake also haunts, her "spirit" caressing the arm of anyone who sits in the chair. A few of us deduced which chair Jim was referring to but after a sit, experienced nothing but a rather comfy cushion. I took a photograph of the ornate chair that captured a tiny dust 'orb', utterly convincing a few passers-by that I had "caught the ghost". We then commenced our trek around the neighborhood, up and down the famously steep streets of San Francisco. Jim had changed into a Dickensian-style cloak and hat and was carrying a kerosene lamp. We came upon a row of manicured Victorian houses where Jim uttered a truism, "people tell me the scariest part of the tour is finding out that these houses go for over $2 million dollars each!" As we crossed California Street, Jim told us to be on the lookout for Flora. Every ghost in the Bay Area has an epithet and Flora is San Francisco's most reported ghost. A young girl from a wealthy family, Flora was betrothed to an older man. Knowing she could never go through with this arranged marriage, she fled the city, taking nothing with her but the bridal gown she wore. She was never seen alive again. Jim claims that many people have seen Flora's ghost, aimlessly wandering the street. No one on our tour saw a thing. As we turned into Sacramento Street, an imposing mansion loomed ahead of us. Richard Craig Chambers, owner of several silver mines in Utah, built the palatial residence in 1887. He died in 1901, bequeathing his property to his two feuding nieces, who detested each other. Unable to live together, one sister moved into a house she had built beside the mansion. Claudia Chambers, a pig fancier, remained in the mansion. Claudia died a gruesome death. Her body was almost sawed in half in what her family reported as "a farm implementation accident". Jim has a different theory. Jim claims that the Chambers mansion housed an "insane male member of the family" who was confined to the attic. One day, he escaped from his confinement and attacked Claudia with a knife, chasing her throughout the house and brutally stabbing her to death. What proof does Jim have to support this theory? Apparently, numerous séances have been held in the house and he has "pieced together the truth from psychic's reports". Furthermore, in the days where the tour included a walk through the mansion itself, one attendee, an "honest cop with the LAPD homicide unit", began "speaking in tongues". Although xenoglossia is usually meaningless gibberish, Jim claims that the cop "revealed the truth of Claudia's death". This was murder, not an "accident". Would this "proof" hold up in court? Jim claims that the mansion is now haunted by violent poltergeist activity. There is "lots of angry energy" with objects being hurled about, household items broken and people attacked! Jim's web site promises that the attendee will have the opportunity to "touch eerie haunted artifacts that sometimes behave strangely". At this point, Jim produced an old key that he claimed was a "relic" from the Chambers house, and possibly the key to the room where Claudia was "murdered". He then performed a trick whereby the key appeared to move of its own accord. Later he also demonstrated 'automatic writing'. Obviously compelled to provide his guests with ghosts, Jim vehemently insisted that these were displays of the paranormal, not of magic. As the cold San Franciscan wind set in, we arrived at Atherton Mansion, California's answer to the Amityville Horror. This is the former home of the beautiful and flirtatious "feminist romance writer" Gertrude Atherton. Gertrude lived with her husband George and mother-in-law. The two women were well known for berating George for being "ineffectual". In an effort to assert himself, George accepted an offer to journey to Chile with a group of sailors. A mere three days into the voyage, George died of kidney failure. The ship's captain preserved George's body in a barrel of rum and his remains were shipped back to his widow. His 'arrival' coincided with the start of some curious phenomena. The Atherton house was besieged by poltergeist activity, forcing the women to flee the home. The phenomena reputedly continues to this day and Gertrude is now also one of the resident ghosts. Jim described Gertrude as "a ghost seen as a glowing ball and likes to play pranks on men". Sylvia Browne once conducted a séance at the Atherton mansion, claiming she could sense the presence of "women who don't like men" and "a frail man". I guess she'd heard this story too. slaves. Here she met the infamous Marie Laveau, the original Voodoo Queen. Mary learned Marie's craft of acquiring 'sensitive' information and cleverly using this to blackmail the elite, to gain wealth and influence. In the mid 19th century, Mary made a final move, to San Francisco, where she continued her mission of liberating the enslaved and is known today by yet another epithet, "The Mother of Civil Rights in California". Mary also employed her cunning to exploit the SF wealthy and amassed an incredible fortune of 30 million dollars! Later in life she was discredited after a disastrous lawsuit and lost her social influence. She died penniless and was buried in Napa. It is believed that Mary haunts the mansion and premises, and can be seen at night, amongst the eucalypt trees that she had actually planted herself. Others claim she is a mischievous ghost, who pelts disbelievers with gumnuts! The corner has become a spot where people visit to 'make a wish'. In keeping with this tale, Jim produced a small 'good luck voodoo doll' and allowed the tour members to make a wish. The bitter cold had set in and I simply wished the tour would end. In an event that I could only attribute to Mary, the tour was over. 1661 Octavia Street plaque honoring African-American Mary Ellen Pleasant. Jim's website states that he shares "real ghost stories based on serious documented research" although this clearly involved a lot of anecdotal 'evidence', bias and dramatic embellishment. Did any of the (mostly believing) tour members witness the guaranteed ghost? No. 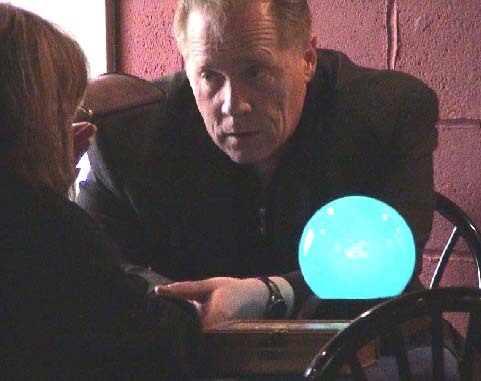 But many interpreted Jim's magic tricks as displays of the paranormal, based on his misleading claims. This was a theatrical tour, presented with great flair but no skepticism. Why, that would spoil the atmosphere! Overall, the tour was extremely entertaining and although the background research for the 'paranormal phenomena' consisted mostly of anecdotal evidence and whimsical newspaper articles, these stories are 'ripping yarns' and are historically significant from a folkloric perspective. And if there are ghosts in this city, who can blame them for hanging around? As Rudyard Kipling once said, "There's only one drawback of San Francisco. It's hard to leave". Karen Stollznow is Associate Editor of The Skeptic magazine and is a Committee Member of the Australian Skeptics Inc. Karen has been an investigative researcher of the paranormal and pseudoscientific for the past ten years. Karen has a prolific publishing record that includes a decade of contributions to The Skeptic, a column in Australasian Science, articles in The Skeptical Inquirer, and a chapter in Michael Shermer's book on alternative medicine, Heilungsversprechen. Karen has a website, www.bad-language.com, a site for busting myths about language, and a resource for skepticism and critical thinking. Bad Language tackles language legends and myths (about swearing, insults, pronunciation, writing, alien languages, speaking in tongues, weird theories and inventions, etc. ), provides general info about skepticism and contains a large collection of Karen's articles. "The Best Little Ghost Tour in Texas!" Voted as one of the Top Ten Ghost Tours In America. "See The Real Haunted Texas Spirits and ghosts of this authentic haunted City and meet wih the real Ghostman of Galveston, Dash Beardsley!" Reservations are recommended. Bring a camera, you never know what you will get on film. Wear comfortable walking shoes and dress for the weather. In case of rain, please call the office to check tour schedule.